A 25-year, $17bn natural gas project supported by Royal Dutch Shell, Iraq's state-owned South Gas Co and Mitsubishi Corp began operations in southern Iraq on Wednesday. The plan is for Basrah Gas Co. to gather and process gas that is released into the atmosphere during petroleum extraction in three massive Iraqi oilfields: Rumaila, West Qurna-1 and Zubair. The gas is currently burnt-off in a process know as "flaring," which is both polluting and wasteful. 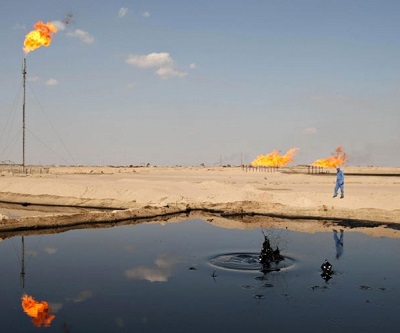 The World Bank says that flaring costs Iraq billions of dollars annually. The captured gas will be used to generate electricity – a positive development for a country still suffering power outages 10 years after the removal of despot Saddam Hussein.